Unbearably Good Catfish at C and C Catfish,Van Buren. So, what does a bear have to do with catfish? The folks at C and C Catfish in Van Buren have a direct connection -- and some pretty good catfish to boot. The Redings, who own the place, put out a pretty good spread. The offerings include steaks, snow crab legs, frog legs, fried oysters and crawfish tails, shrimp, chicken, and catfish. 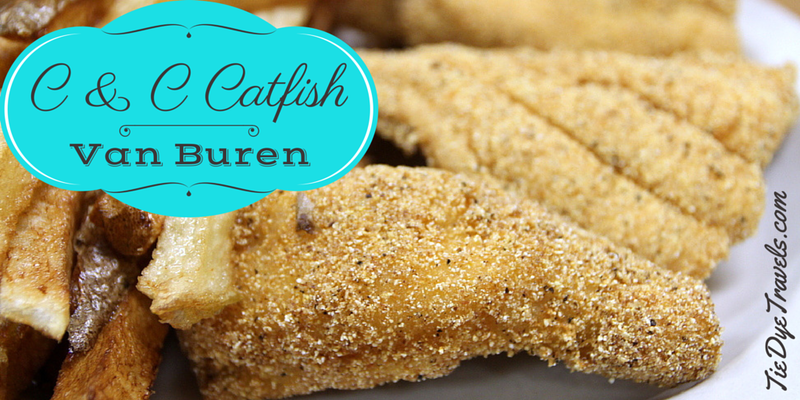 I will go on the record to point out that catfish has to be really dang good for me to like it. Muddy catfish leaves me cold. Cold catfish leaves me... cold. But well-prepared, fresh catfish is a singularly good thing I can dig into. So, C and C Catfish -- it's about a block off the main drag, Fayetteville Road on the north side of Van Buren. You turn west onto Rena Road a couple blocks north of I-40 and just look for the only building on the right where folks are gathering. From what I understand, it's the only sit-down seafood joint in town, so sometimes there's a crowd. We dropped in on a family visit in September. Didn't take long for Hunter to order -- there were a good dozen items on the kids menu and she went for corn dog bites -- which, heck, she's a kid, whatever. We placed our orders and soon had set-ups delivered. Now, when I say set-up, I mean the items that come to the table before the meal. They included pinto beans -- cooked until the beans were creamy but not so far as to be indistinguishable from the fluid they floated in, delicately spiced but even better with shots of one of the many sauces available (I noticed Grav went for Louisiana Hot Sauce). There was also green tomato relish (what I know as green tomato relish, also known as pickled green tomatoes, and NOT chow-chow... we're having an argument about this over on Facebook) in its own bowl, pungent and sweet. There was a plate of add-in including jalapeno slices, red onion slivers and dill pickles. There was a bowl of sweet coleslaw. And then there were hush puppies. Golly, hush puppies. They can get me in such big trouble. These were more on the flour-y and golden side, addictive to a fault, and PERFECT for those pinto beans. We each dolloped out beans and I wiped mine up with torn-apart hush puppies. Man, that's an excellent meal right there. Oh -- a note -- if you're eating light, you can go ahead and get yourself a set-up with fries for $6.49. So, that would have been enough. Hunter was even digging on the pintos and making those hush puppies disappear, and then dinner arrived. And for the first time ever, I am not going to post the photo of Hunter with her dish, because she made one of the most disgusting open-mouthed faces I've ever seen on this child, and I don't want to disturb your reading. I have a reputation to uphold, after all. discussion. He had instead of going for the catfish, chosen the Make Your Own Dinner and had selected fried oysters and fried crawfish tails, which came siding up to his not-so-neat pile of perfect just-cut fries like little gourds out of a cornicopia. They were fresh-fried and those oysters were juicy. I had to steal one just to verify their awesomeness. Don't tell Grav. were very lightly battered, just barely golden and fall-apart nice. They were just salted and peppered, nothing much more, and they were just... well, okay, I liked this catfish a whole lot. I loved it even more with green tomato relish (the heck with tartar sauce) and I liked it on its own. It's good stuff. Those fries, though. I just have to mention them because dang it, they were great. They really were. So, I was mentioning bears and catfish. Turns out there's a bear there. No, really, a real stuffed bear that the Redings regularly dress up. See, Brian Reding took that bear down. With a bow. I'm not joking. Go look on the Facebook page and see. Hunter was even a little nervous about it, and wouldn't get close enough to actually side up to that bear. I need to get back over to C and C Catfish at some other point and try out some of the other delicacies. For you catfish lovers, do know you can do an All You Can Eat on that catfish with the beans and coleslaw for $17,99 any time they're open. Really want to go all the way? Do the $34.99 version and get as much shrimp, coconut shrimp, crawfish tails, fried oysters, crab legs, frog legs and catfish as you can shove down your gullet. No sharing and no take-out, please. And you can get that catfish grilled or Cajun blackened, which is likely what I'm going to do next time I go. That and maybe the crab legs. One more tip -- for seniors, C and C Catfish is a really good deal. There's a couple dollars off difference for those catfish dinners. Not bad. Awesome catfish. Nice and friendly staff. Only place I will go for a catfish dinner. Love it.